Check Out The New Teaser Poster For ‘IT Chapter Two’ Inside! Halloween might be over now, but it’s never too early to start preparing for the upcoming round of scares next year. 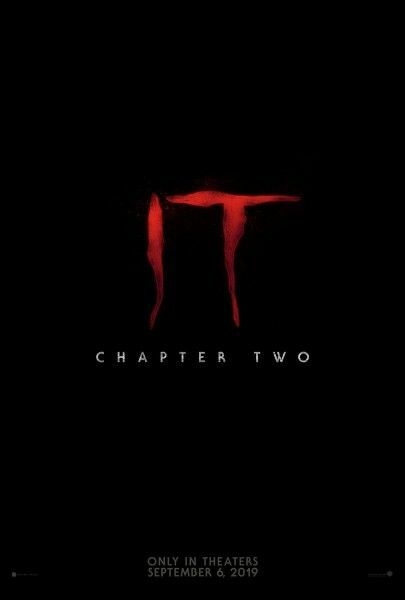 ‘IT Chapter Two‘ is set to be released in September of 2019, and to get you hyped, they released the teaser poster you see at the bottom of this page. Admittedly, the poster is pretty lame. It mainly just acts as a reminder that the movie is going to be released next year. For those who don’t know, this sequel will take place 27 years after the events of the first film. The adult cast will include James McAvoy, Jessica Chastain, Bill Hader, Jay Ryan and James Ranson. And obviously Bill Skarsgard will return to reprise his role as the killer clown. The kids from the first film will also return during flashbacks. The first movie premiered in September of 2017 and made over $123 million during its opening weekend. It was the highest opening weekend for a September release in movie history.